Pack pals/ keychains for Alastair and his friends. I’m pleased to report that my keychain tutorial is posted at Brother’s website. Any of these links will take you there. I’m pleased to report that my keychain tutorial is now posted at Brother’s website. Any of the links at the end of this post will take you there. I just buy the felt sheets at WalMart, JoAnn’s or Michaels. They are 9×12″ or 12 x 18″. The smaller soft ones run about $.25 each and the larger stiff ones about $.59. Of course, you could use some by-the-yard felt, but I don’t think that comes in the stiff weight. When I first got on this jag, I used soft for both with a cutaway stabilizer for the first hooping. But then I could not get rid of the stabilizer beyond the outline and had to color it with a sharpie. Still, the keychain was too floppy to suit me. So I went with the stiff stuff. You can use stiff for both layers, but with my stiff hands, it is hard to cut through two layers of that. Now I always use stiff for the top but when I can’t find matching colored soft felt, I use stiff for both. When I first heard about these keychains, I too was puzzled about their attachment to the backpacks. I discovered that they just loop over the hanger loop with the embroidered piece slipping through the loop or over the wider shoulder strap. That is why you need such a long loop. 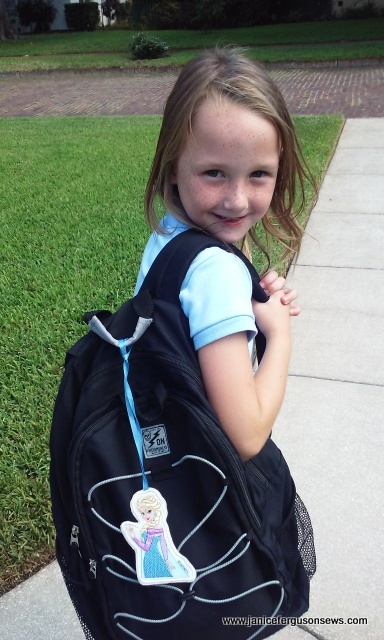 I’m guessing backpack straps are about 2″ wide, so that uses up 4″ of the ribbon loop. Then the embroidery has to fit through the remaining opening. A second tutorial for other machines was to be posted at this time. But a wicked case of bronchitis and life in general got in the way. I expect you know how that happens. But it will be posted soon. I have a cute story to share with you about these keychains. You know how pleasing it is to know that your projects are appreciated by the recipients. Those shown above were made for my 6 yo grandson, Alastair. After receiving a keychain that had just the text Pokemon, he asked me if I would please make some Pokemon character keychains for him and his pals. Additionally, he asked if I could make a Frozen keychain for his sweet friend Maddie. I was on it in a New York minute. The day after I mailed all 12 keychains to him, including 3 Frozen figures for Maddie, she approached Alastair’s mother after school. Immediately she was gently reprimanded by her mother for this bold request. But my Rebecca, unaware that they were already in the mail, assured her that perhaps she would have one for her birthday next month. Now, a week later, keychains have not yet arrived (hurry up, USPS!!!). I am so eager to hear her reaction to these special delights made just for her. Each day since then I have been hoping it would arrive. Children are always thrilled when there is a short time between asking and receiving. I hoped Maddie would have an experience much like one my son experienced when he was 10. About two weeks before the start of 5th grade, he spotted an ad in Boys’ Life magazine. Immediately he sent off an order along with his hard earned chore money. He deemed these hard-to-find items useful for the new school year. His plans for these items included shocking Merry who was always seated next to him (alphabetically.) From her neatly organized desk she frequently chided him for his untidy work space. A week ago I ordered imitation vomit, garlic bubble gum, and fake dog poop. I ordered these because I NEED them (his caps). If I don’t receive them immediately, I will tell my friends about this and they will tell their friends and they will tell their friends. Soon you will be out of the fake dog poop business. The first day of school, he put the imitation vomit on Merry’s chair and placed the dog poop in her desk. I don’t know what he did with the garlic gum. Let me know what you think of the tutorial and if you have any questions. Happy sewing! 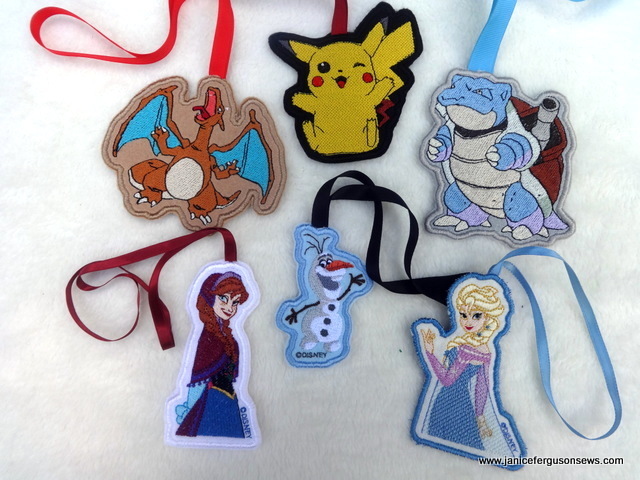 This entry was posted in accessories, Disney, Disney projects, machine embroidery, Nana fun, techniques, Tutorials and tagged Disney keychains, Frozen keychains. Bookmark the permalink. You need the Brother Scan ‘N Cut to help you cut out the bookmarks or use the hoop soft felt using using was a way, cut out and starch. Oops, original did not come out correctly. You need the Brother Scan ‘N Cut to help you cut out the bookmarks. Another option is to hoop a wash-away stabilizer, embroider soft felt, cut out, then starch.